New branded lorries now on the road! 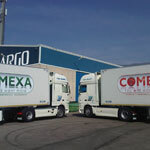 Our delivery vehicles, now bearing the Comexa brand, are on the road and making regular deliveries across the UK and the rest of Europe..
At long last the Comexa website is now online. Find out more about Comexa and our team, read about recent developments and see images of our produce. Copyright 2011 - Comexa Europa S.L.